Loved it! And full of surprises… I think! I love that my co-workers recommend such great novels/authors! I borrowed this book from a woman at work after we got into discussing what kind of novels we liked to read. 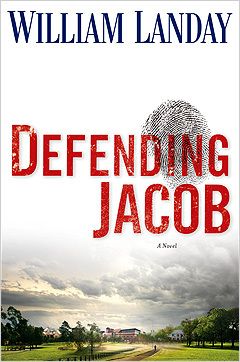 She thought that I would really enjoy Defending Jacob by William Landay. She was correct! Like one of my other favorites, Rizzoli & Isles, this mystery takes place in Massachusetts. While I enjoy reading books set in other American towns, other countries, or even fictional and fantastical worlds, there is something special about reading a novel set in towns that you’re familiar with. Major scenes occur on roads that I’ve driven down or in parks that I’ve walked through and it sends a real chill down my spine. In this novel, however, there are countless instances where a very real chill is sent down your spine and it truly has nothing to do with location. The story of Jacob is told from the POV of his father, but enough evidence is presented to allow the reader the opportunity to make their own judgment on whether or not Jacob is guilty. I won’t say what opinion I came to and, really, it’s almost irrelevant. At times, it appears as though the main story on display in the disintegration of the family under the stress and publicity surrounding the case. Whether or not you find the boy guilty, it’s hard to not feel some remorse for everything that they’re going through. And this is even a slightly uncomfortable situation to be in – especially if you think that he did it. There is a really amazing twist in here, as well. I assumed that I had this book all figured out, but I was very, very wrong. Landay does an excellent job of fully showcasing the emotions, thoughts, and pain that the father experiences. Despite my not being a parent myself, I was extremely touched and could almost feel the emptiness that Andy felt. This is one of those books that will stay with you for a while. So, if you’re not in the mood to carry something heavy around with you for a few days, you might not want to take this book on.